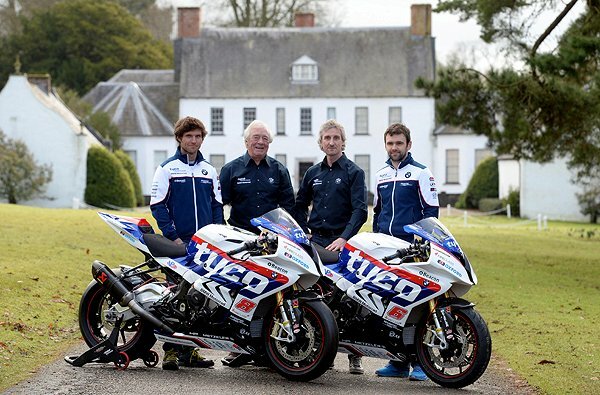 The 17th Century National Trust plantation house at Springhill, just a stone's throw from TAS Racing's headquarters in Moneymore, was the perfect venue to launch this year's Tyco BMW International Road Racing team of Guy Martin and William Dunlop for the 2015 Isle of Man TT Races fuelled by Monster Energy. Martin said of the new venture by TAS Racing and his stable of Tyco BMW Motorrad machinery for this season: "I always give one hundred percent effort, no matter what I'm doing but I'm not going to make any stupid predictions for the year ahead. I'm confident that the Tyco BMW Motorrad bikes will make all the difference this year. It really does look mint. "People have been asking questions about the retirement story that was in the press, but all I'm interested in is going to the TT and trying to win on this new bike. I'll only start to think about what I'm doing after that when I'm on the boat home." On his pre-season preparations Martin added: "I wouldn't even consider turning up if I wasn't fully prepared. It's not about money for me, or waving at the crowd and picking up cheques. Stuff that. I go to the TT to try and win and I believe with the same effort as before, and with these guys behind me, the Tyco BMW will be good enough for the job. I will be well prepared and after that what-will-be will-be." His team-mate for a second consecutive season will be William Dunlop, an international Superbike winner with TAS Racing and Tyco last year at the North West 200. The Ballymoney man does his talking on track, but did say of the new BMW Motorrad machinery. "Yeah I just love the look of the new bike, and if it goes as well as it looks then we are in for a good year. I enjoy working with Guy; he's great craic and we had fun working together last year. To win a TT is the main goal for us both and on these new S1000RR bikes both in Superbike and Superstock trim - we shouldn't be too far away." "It was worth the extra effort getting two bikes prepared and what a setting we have in Springhill House, right here on our doorstep. It was great to get Guy and William together for the shoot, and the next step is to get them out on track in Spain in the next couple of weeks. Both are looking fit and well and like the BSB boys, they can't wait to get their first run on the Tyco BMW S1000RR. There's a lot of hard work still to do, but there's also a lot of excitement in our camp for the year ahead."